ike all other art forms, Ron once observed music is "designed to tell a story." The statement is not only indicative of his approach as director and arranger of musical groups, but also says much regarding his own compositions. As noted, his formal entrance into the field began in the early 1930s as a balladeer on Washington, DC's radio WOL. Although no recordings were preserved, he was said to have performed his own works in an admirable baritone while accompanying himself on ukulele. In this same capacity, and through his 1940 Alaskan Radio Experimental Expedition, he performed on Ketchikan, Alaska's KGBU radio. 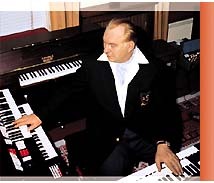 Thereafter, he continued to compose and perform on a casual basis until 1974, when he organized several musical groups from crew members aboard his research vessel, Apollo, to provide entertainment at the regular ports of call. At the outset, the repertoire was most accurately described as popular jazz, i.e., jazz versions of Gershwin standards and the like. In addition to drums, bass and guitars, instrumentation soon included brass, keyboards and flute. Yet following from an LRH analysis of what drives popular trends, and particularly ways in which music affects young people, Ron soon saw to the formation of several specialized groups in keeping with local tastes: a flamenco ensemble, replete with dancers, a Middle Eastern inspired vocalist and the contemporary Marineros offering then popular Progressiva pop. At the forefront of Apollo entertainment, however, remained the Apollo Stars and what became known as the "Star Sound."